Below is a poem that I wrote in honor of my grandmother, a Russian immigrant with only a grade school education who taught herself to read and write English. Her minimal English skills did not stop her from writing weekly letters to her son. My sister and I enjoyed her letters more for the two sticks of Doublemint gum that she always included in the envelope than for the news that the letters contained. Many summers we would make the 3 day drive from Burbank to vacation in Seattle, Washington, where she and my grandfather lived. Besides visiting the sights of Seattle, our vacation days there revolved around mealtimes. Although my parents, sister and I stayed in a local hotel, we would eat our daily meals at my grandparent’s home. My grandma delighted in cooking and baking these meals for us. During these days of Elul I take comfort in remembering my grandparents, aunts and uncles whose loving and caring ways serve as an inspiration to me. Watching the oven as the minutes passed and the food baked. I recall eating delicious homentashen that took her days to make. Then letting them sit three days in a bowl on the pantry shelf. And finally, rolling out the dough, and filling each piece with the moist, black seeds. Packing them in a cardboard box bound with string. They arrived at our home in a box, battered by its trip from Seattle to Burbank. My sister and I excitedly tore the box open to enjoy its delicacies. 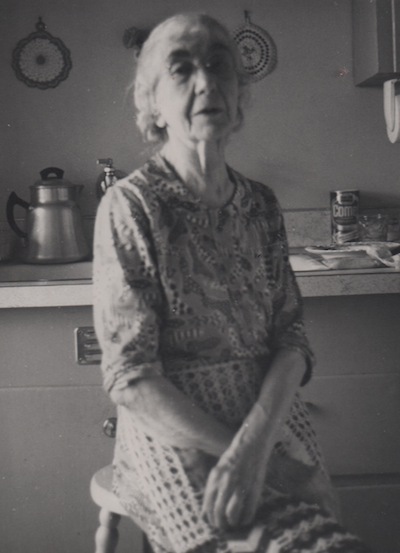 The kitchen was the center of her home. Her only child and his family was the center of her universe. Across the nine hundred miles that divided us. My grandmother in the kitchen sitting on a stool in front of the oven waiting as the food bakes.